Chance Garden, a horticultural attraction was built in 1936 by Mr. Albert Bishop Chance, as an expression of his gratitude to the community for it's support through the years. In 1927 Mr. Chance took a world tour. He was so inspired by the gardens he saw that upon his return he built one of his own. The garden was designed by Mrs. Maude Dawson Taylor, landscape architect of Kansas City, Missouri. The oriental influence may be sensed in the artful harmony of wood, water, rocks, trees, shrubs and flowers as well as in the design of entrances and garden pergola. Key features include a massive stone arch and wishing well. Above A.B. Chance's head is the old logo for the A.B. Chance Company he founded. Across a low, pine-topped berm, a brook cascades down a miniature mountainside, joining a smaller spring fed stream and then meandering through a rock strewn valley. A rock grotto is among the gardens best known attractions, reminiscent of caves constructed in early Chinese landscapes, is lined with unusual specimens from Missouri caves. Chance Garden, now listed on the National Historic Registry, is Boone County's oldest garden open to the public. It continues to attract thousands of visitors annually. Some return several times during the year to admire the changes brought by the advancing seasons. 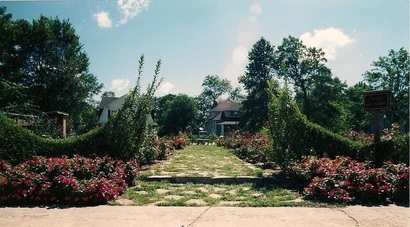 A 1995 addition, the Rose Garden, sits adjacent to the Chance Museum. Its design compliments the architecture of the 1904 Queen Ann Victorian style house. From May to November the Rose Garden is ablaze with the blooms of 400+ different varieties of Hybrid Tea and Floribunda Roses. The Victorian style house was built in 1904 by a pharmacist, Robert Linwood Hope and his wife, Belle Downing Hope. They lived there with their son until 1908. Charles Early and his wife bought the house and lived there with their family. Albert Bishop Chance and his wife Frances Gano Chance bought the house in 1923 and lived there until his death in 1949. The house was then converted into the Chance Company guest house and used in this manner from 1954 to 1973. In 1974, the Chance Foundation provided the house to the Centralia Historical Society, Inc. for a museum. As you tour this gracious house look for elaborate details such as the carved woodwork, leaded, curved, beveled, and stained-glass windows, the built in china cabinets and the butler's serving window. The museum contains a Civil War Room and a room dedicated to the products made by Hubbell Power Systems. The museum is open on Wednesday and Sunday afternoons from 2:00 to 4:00 p.m. Annually different displays are showcased. Centralia has a rich history and the mural was painted to depict parts of it. Centralia was known as the Prairie Queen because of the vast prairie it was founded on. Our founding fathers commissioned an artist to record the best qualities of the ladies of Centralia. Those qualities were combined into one image and that drawing became known as the Prairie Queen. In the mural the Prairie Queen is opening the book of Centralia's history. Central to Centralia's history is the railroad. Pictured in the mural is the depot and a train. The stagecoach was also important to transportation as well as during the Civil War. The stagecoach in the mural is representing the events leading up to the the Centralia Massacre. Flags representing the North and South are both included in the images because Centralia's population was divided during the Civil War. At the top is Adam Rodemyre the founder and editor of the Centralia Fireside Guard. Down front in the center is A.B. Chance with his first invention. That invention was the reverse handlebars. He did not receive a patent on that invention someone else beat him to it. Above A.B. Chance's head is the old logo for the A.B. Chance Company he founded. Chance Gardens are included with the wishing well that it is so famous for. Many couples have been married in the gardens so an image of a couple marrying has been included. On the far left is the old water tower that has since been torn down. Under that image is an original city water and light truck. The young man carrying the boots is Rusty Bugg the gentlemen that actually drove that truck. In front of the truck is his sister Ruth. Of course on the right are several native american shelters representing those who were here before us. The mural was painted by Jim LeGrande and is located at the corner of Railroad and Allen. The 23.2 acre Centralia Battlefield is three miles southeast of Centralia on Rangeline Road. The Centralia Battlefield is an important educational tool. From history lessons for school children to re-enactments and archaeological surveys, the battlefield is a lifesize classroom. Located on the Battlefield is a monument describing the events of September 27 donated by the Sons of the Confederate Veterans. A monument honoring those Union Soldiers that died was donated by the Daughters of Union Veterans of the Civil War. The Battlefield is open to the public and contains a picnic area and 2 Civil War Markers. Markers at the Centralia Massacre site on Railroad Street, the city square on Singleton Street and the Centralia Battlefield on Rangeline Road depict the Civil War events of September 27, 1864.